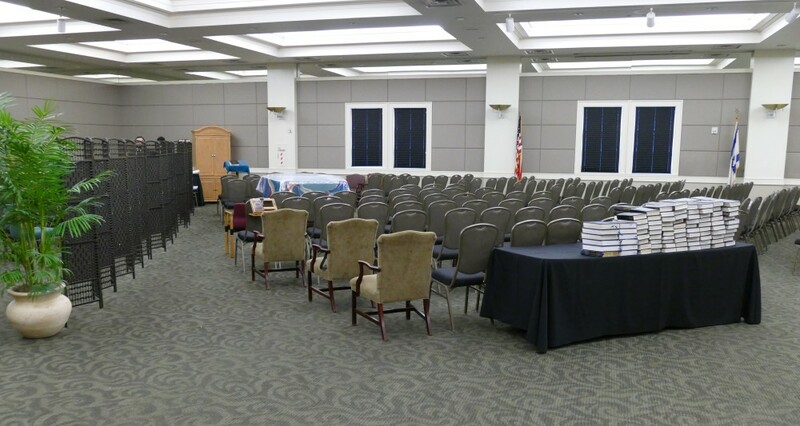 Above: The mechitza erected in Heritage Hall at Beth Jacob divides 55 seats for women from 135 for men. Congregation Beth Jacob is spending Shabbat in Heritage Hall instead of its historic sanctuary this summer, but the transformation taking place in the Toco Hills shul is more than physical. Rabbi Ilan Feldman said the planning for the renovations on the building, which opened in 1962, sparked a congregational conversation about spiritual renewal and led to a yearlong focus on spiritual building blocks after the celebration of the building’s 50th birthday. The lobby shows the early signs of the renovations, but because the front entrance is being closed, congregants will enter the building just outside Heritage Hall instead. And now that the congregation is gathering for services in the tighter space of the synagogue social hall, people are enjoying a more intimate feeling from worship, said Michael Cenker, who is leading the renovation project for Beth Jacob. He can be seen in weekly video updates on the progress at www.bjrenovationproject.org. After years of planning and fundraising so that Beth Jacob had enough cash and pledges to cover Phase 1, construction began in the second week of May. 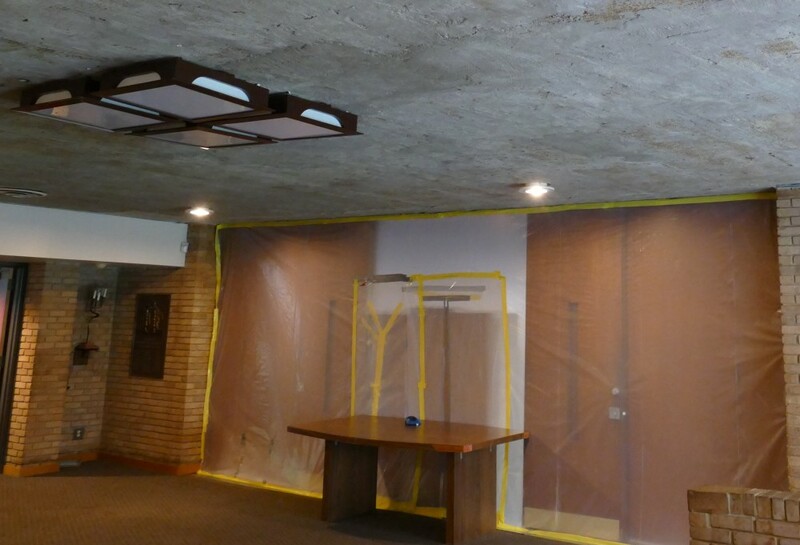 Early work included asbestos abatement in the lobby ceiling and the sanctuary floor, leading to the sight of a bare, plaster-and-mesh ceiling outside plastic-sealed sanctuary doors for Erev Shabbat on May 20. The renovation project is a response to certain mechanical needs, such as the replacement of a heating and air-conditioning system that proved it was nearing the end by filling the sanctuary with smoke May 7, as well as the desires of the congregation for improvements, Rabbi Feldman said. He praised general contractor Humphries and Co. and architect Sandy Cooper for understanding and embracing the challenges from the start. Cenker said the sanctuary is iconic, but it also reflects the building style of the 1950s and the 1960s in its sloped seating. That slope has long been a source of congregant complaints, Rabbi Feldman said, and some people even brought artificial floors to provide level surfaces for the frequent standing. To increase comfort and shift the feeling of the shul from observation to participation, the floor under the pews is being raised to the level of the outer ring, making people in the front 28 inches closer to the level of the pulpit. “We wanted to have less of a throne room effect,” Rabbi Feldman said. The seating — which might be pews or individual seats, a decision Cenker said is overdue — is being adjusted so that the curving isn’t quite circular. Everyone will look eastward while also facing the ark, and the seating capacity will be reduced slightly. Space behind the seats will accommodate the big crowds of the High Holidays. Space in the center will accommodate a chuppah for weddings. The growth in that community, leading to multiple services in different parts of the building each Saturday, inspired one of the more noticeable changes: The bifold doors entering the sanctuary are being replaced with two sets of glass doors that will act as a sound lock. When one set is open, the other set is sealed shut, keeping out noise from the lobby. 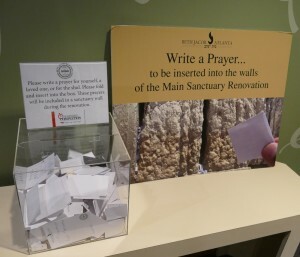 That change will work with improved acoustics in the sanctuary, resulting from the level floor and from the installation of woodwork at that bottom of the barrel of windows above the bimah. The angled woodwork will keep the sound at the level of the congregants. 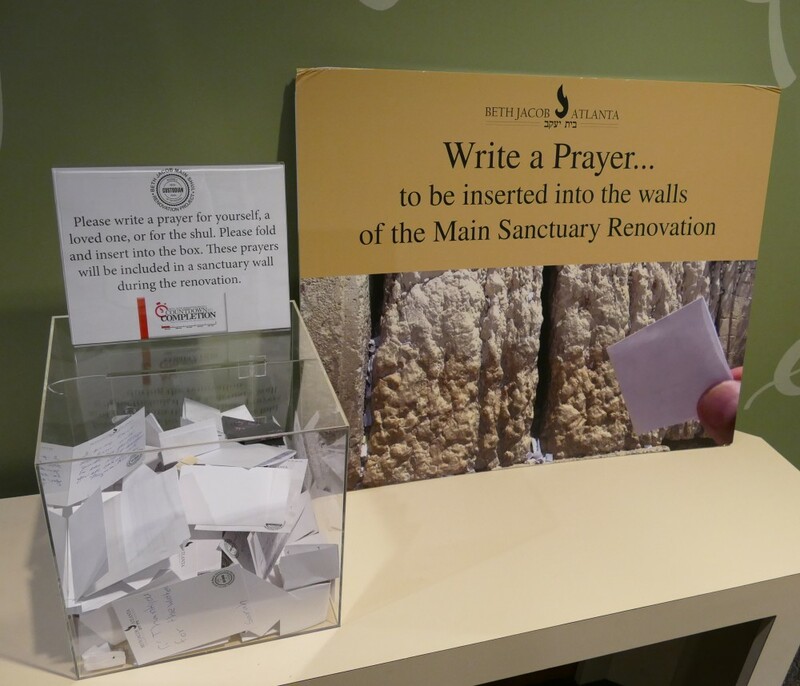 A special feature of the renovation comes from the inspiration of the Kotel: Congregants are writing prayers and messages on pieces of paper that will be sealed inside one of the walls. “In a house that’s devoted to prayer, we’ll actually have prayers embedded in the wall,” Rabbi Feldman said. The solution uses mesh and angled lighting but no glass to create a divider that acts like a two-way mirror, Cenker said, enabling the women to see through it but reflecting the wayward gaze of any man. The congregants thus will be able to focus on a new ark that will maintain the style of the original one. The ark will be grander and have a wider opening, providing easier access to and better display of the Torahs, Rabbi Feldman said. The new ark is designed to work with the replacement of the sanctuary’s large windows, the core of the project’s Phase 2. That phase is an unscheduled necessity, Rabbi Feldman said, awaiting the fundraising to pay for it. 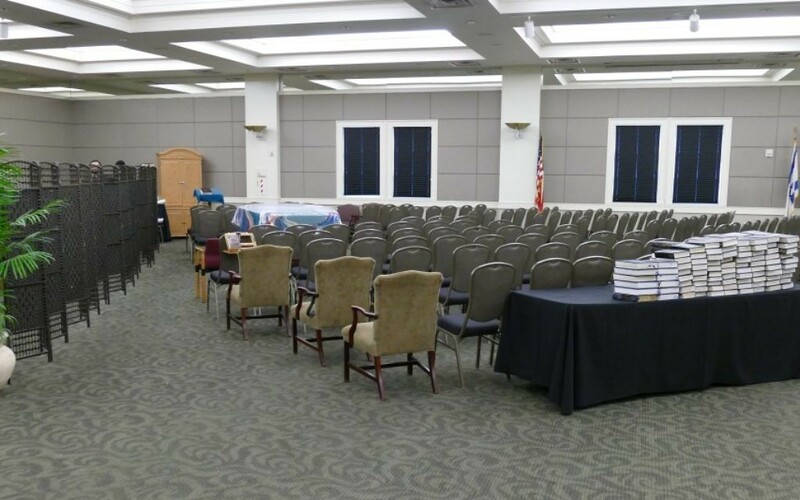 Rabbi Yitzchok Tendler, Beth Jacob’s executive director, said he is confident that Phase 2, which also includes some cosmetic changes to the lobby, will follow soon after Phase 1 — perhaps without any break. That would mean the High Holidays would not be back in the sanctuary as now planned, but Rabbi Tendler said the inconvenience will be worth it to return to the completed sanctuary. The new windows will be the grand finale of the project, Rabbi Feldman said. “This synagogue is actually an iconic structure. It’s a unique shape, and it’s really been a symbol of the growth and resurgence of Orthodoxy in the Southeast, and those windows are designed really to replicate conceptually the 12 windows of the Temple in Jerusalem, and there the whole idea was that light radiates out from the Temple to the rest of the world,” Rabbi Feldman said. In the meantime, Cenker said, four months of intimate services in Heritage Hall will train the congregation for the improved experience amid the new sanctuary’s magnificence.